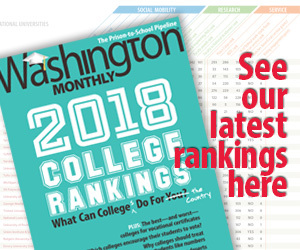 Washington Monthly | What Do 2,358 College Administrators Do? What Do 2,358 College Administrators Do? For at least a half-century, the University of California has been considered the premier system in U.S. public higher education. The Berkeley and Los Angeles campuses always rank among the top 10 state schools, with several other UC campuses close behind. While the nomination of Janet Napolitano, the secretary of the Homeland Security Department, as the next chancellor of the University of California may have been a surprise, it isn’t a comedown. The system has almost 240,000 students and an operating budget that exceeds $24 billion, almost triple the state budget of Arizona, for example, where Napolitano served as governor and attorney general. Historically, a lawyer-politician who has never been a college professor, let alone a higher-education administrator, might not have been the preferred choice to lead a huge public university. But that has changed in recent years. Universities – – private as well as public — are very much creatures of the U.S. political scene, highly dependent on federal and state funds. Who better to navigate that world than former elected officials? Napolitano joins such ex-politicians as Mitch Daniels at Purdue University, David Boren of the University of Oklahoma and Kent Hance of Texas Tech University. The University of California embodies both the best and worst in American higher education. Some of its research is cutting-edge, and many UC graduates have achieved positions of power, wealth and eminence. And they obtained their degrees for a fraction of the cost charged at most equivalent private universities. Yet UC’s annual spending exceeds that of most state governments, amounting to roughly $100,000 for each of its students. Much of this is unrelated to instructional function. The university’s bureaucracy is famously monumental, centralized and costly: Aside from a full cohort of administrators and support staff at each of the 10 campuses, the central office in Oakland employs more than 2,000 workers, a staggering number (2,358 full-time employees, according to the Integrated Postsecondary Education Data System). There are 10 “divisions” in the Office of the President, for example. Its “external relations” division lists more than 55 managerial-type employees on organizational charts, and that number doesn’t include support personnel. The “business operations” and “academic affairs” divisions are much larger. One senior non-UC university president said to me once that the central office could be reduced by more than half and the university wouldn’t suffer. The university took some budgetary hits from the state in recent years but offset them with huge tuition increases. No serious attempt was made to vastly cut costs. How many senior faculty at, say, Berkeley teach more than 200 hours a year? How much of the so-called research by these professors is read or cited? I suspect a lot of it has little impact. How many buildings lie largely dormant for months each year? The approach to “reform” by Governor Jerry Brown and California legislators is to have more free online courses. Let’s not upset the natives (faculty and staff) on the campuses with fundamental change. For all its moaning about tight finances, the University of California has largely been financially protected from and blind to the economic reality in the outside world: In the U.S. — and especially California — economic growth has been falling, college costs have been rising faster than incomes, student-loan debt has been piling up, and the labor market has stagnated. Rather than bring in a leader with a proven record of recognizing the need to re-examine the public university and innovate to face these realities, the university’s Board of Regents has brought in a veteran at managing and perpetuating bureaucracies, one well-connected enough to keep the federal flow of support coming and to shake more money from the state’s already overburdened taxpayers. Perhaps Napolitano has the ability and ambition to adapt to grasp the new reality and make needed changes. My expectations are low.